Helmsley is a North Yorkshire market town located within the North York Moors National Park. The Castle Keep on the left is pretty much all that is left of the castle, and the buildings on the right are 16th century additions which were constructed as residential apartments. The castle is almost 900 years old but it was originally made of wood. This view is from the walled garden and contrasts the softness and organic forms of the trees and flowers with the stark, harsh and rugged lines and textures of the castle and manor house. I toned the image and added a vignette to take the viewer into the image. The almost triangular shape of the flowers in the foreground points straight at the only two people in the scene who provide scale to show how imposing the walls and buildings are. 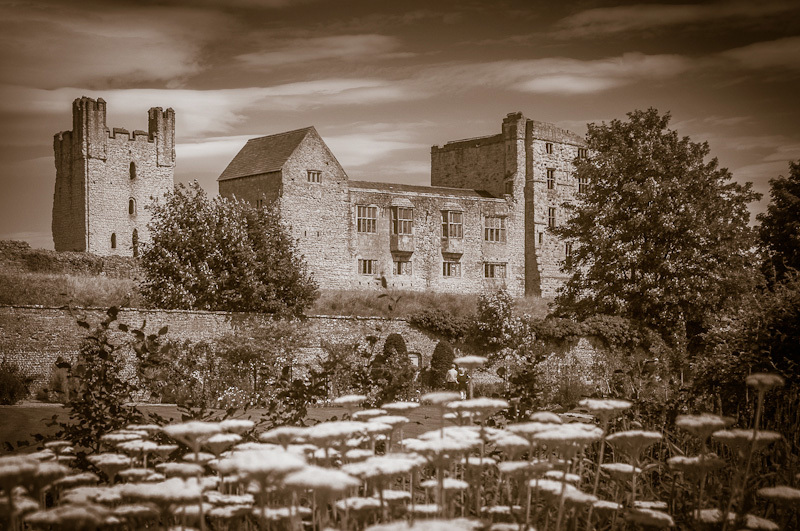 Helmsley Castle from the walled garden. I know what you mean but maybe just a happy accident. The original is rediculously colourful with lots of green and yellow and blue. I lifted the yellows a lot and the greens to a slightly less degree. Also the blue in the sky was darkened, so maybe I pushed it in that direction. Perhaps I should save this recipe as an infrared pre-set! Clever use of toning, Frank. It suits this image really well. Thanks for commenting Andy. Sorry for the slow response time, just back from a nine day trip.